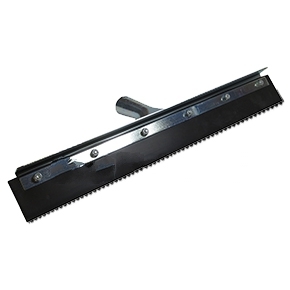 PRODUCT: 24" SERRATED 3/16" (V-notched) BLACK NEOPRENE RUBBER BLADE, STRAIGHT SQUEEGE. SET IN STEEL FRAME. BLADE CAN BE REPLACED IN FRAME. 6/CARTON. PRICE/CARTON. Serrations: no notch, 3/16", 1/4", 3/8 and 1/2" V-serrations.